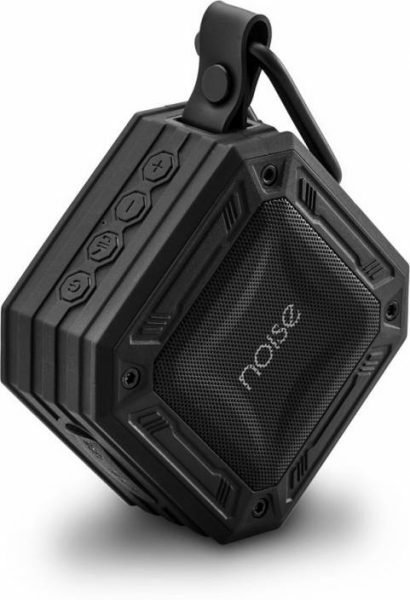 Noise Aqua Mini speaker is very compact portable speaker and can be easily carried with you. It is also light weight and weighs just 215gms and can be your ideal companion if you want to enjoy your music on the go. It can be easily tucked in your trouser. The other USP of this speaker is that it is waterproof and will remain harmless if it is submerged in water of up to 1 meter. It enables you to enjoy the music in your pool party or when you are taking shower in your bathroom. In the box, you will get Speaker in black color as it comes in this color only, user Manual, AUX cable and USB cable. With its Bluetooth compatiblity feature, you can easily pair the Bluetooth enabled devices with this speaker and it is equipped with built in mic for handsfree calling. You can also enjoy music from your favourite FM radio stations on this speaker. Its rugged rubber housing allows it be carried without the danger of getting it damaged even in tough conditions. On this speaker, you can play, pause , skip and control your calls with easy to use buttons. As far as its audio output is concerned, this speaker will not disappoint you if you want to hear your favourite music on the go or in a small gathering. I have run all genres of music on this speaker via Bluetooth with my smartphone and also by pluggin in Aux cable. The sound output is quite loud and was impressed the most with its Deep Bass feature. If you have liking for deep bass in your music then this is ideal choice for you. I have observed that if you are running a very fast number with full volume then sometimes there are chances of output getting little bit distorted. But if you are playing slow numbers then there is no such problem irrespective of the volume. As far as battery performance is concerned, it works easily for upto seven hours although the company claims it to last for eight hours and that too is more than enough for single charge. This speaker has MRP of Rs. 3499 mentioned on its box but you can get it for Rs. 1999 on Amazon.in. At this price, this speaker is worth the buy especially if you are looking at waterproof and Deep Bass features.